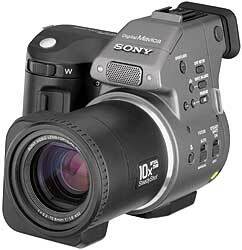 The following products were announced at the Sony Press Conference at the PMA Show in Las Vegas, Nevada. 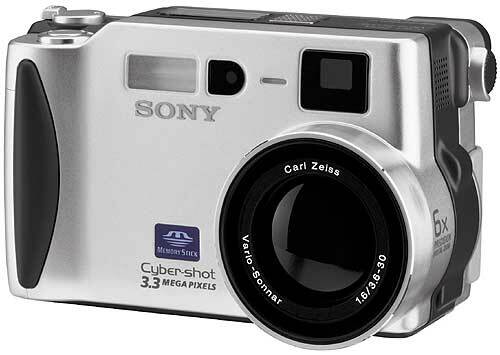 The Cyber-shot DSC-S70 combines 3.3 megapixels with Carl Zeiss optics in an $800 package. It features a 3X optical zoom, 12 bit A/D conversion for improved dynamic range, built-in intelligent flash, TIFF and JPEG file formats, USB file transfer, selectable 4:3 or 3:2 image aspect ratio and MPEG Movie Mode. The in-camera zoom, trim and resizing tools allows you to modify your pictures without requiring external imaging software. The Cyber-shot DSC-S70 runs on rechargeable InfoLithium batteries and will be available in May for $800. This new Sony UP-DP10 printer gives you the capability of creating laminated, 4" x 6" borderless pictures, with photo-lab quality, at home, quickly and easily. The UP-DP10 connects to your computer via USB or parallel port and supports both Windows and Macintosh computers. With its built in Auto Color Correction feature, the contrast, tone, color balance and/or sharpness of the of the image can be automatically adjusted and a print takes about 85 seconds to print. Media will be offered in two formats - one for 2:3 aspect ratio and another for 3:4 aspect ratio. Packs will retail for $15 for 25 prints and "Sony Digital Photography" is printed on the back of each picture. 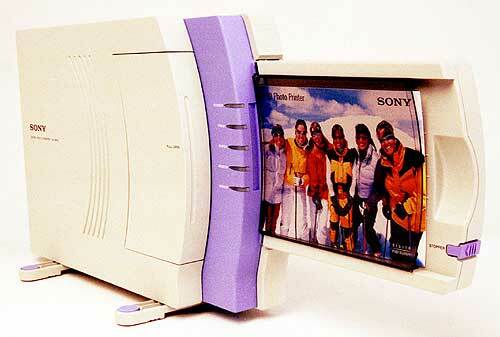 The Sony UP-DP10 will be available in the Spring of 2000, for $389. This PictureBook computer blends a 400 MHz Intel mobile Pentium II processor, a 12 GB hard drive and a 410,000 pixel CCD Camera with up to 640 x 480 resolution in still mode into a slim package. It also includes the usual 56K v.90 modem; i.LINK interface, external USB floppy drive, as well as video and USB interfaces. 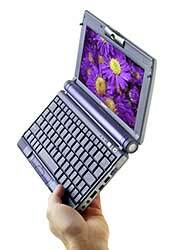 With the bundled Sony DVgate motion digital editing software, this compact notebook can edit digital video. This VAIO C1XS PictureBook is an improvement over its predecessor, the Vaio C1X, since it captures images at a 50 percent higher resolution and has a larger 17 mm pitch keyboard. It is also sleeker than the C1X, weighing only 2.2 pounds and being only 1.14-inches thick. The VAIO C1XS PictureBook begins shipping this month (February 2000) and has an estimated price under $2,300.